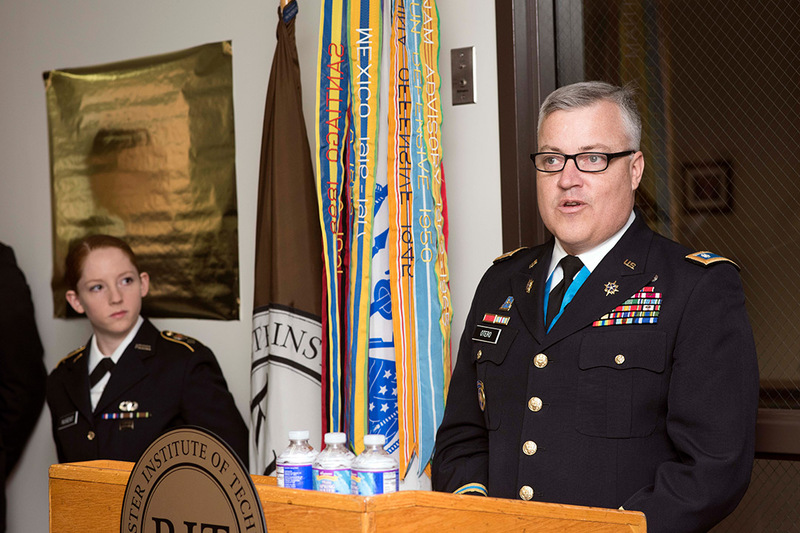 Lt. Col. Christopher Otero, commanding officer of RIT’s Tiger Battalion, speaks at an event celebrating the 50 years of the Army ROTC program at RIT. In 1969, the Army ROTC program at Rochester Institute of Technology began with 54 students. By 1971, eight would be commissioned and serve in the early years of Vietnam. Fifty years and more than 500 cadets later, the Tiger Battalion at RIT is commemorating its golden anniversary. 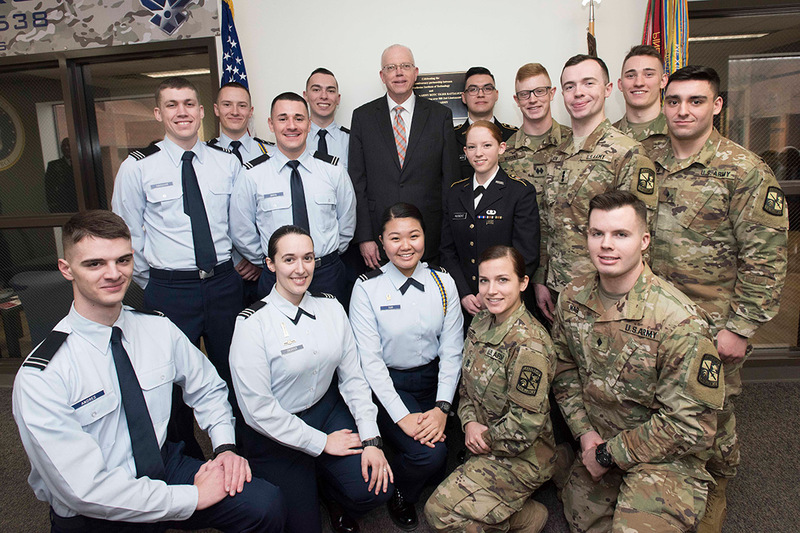 The cadre leadership and student-cadets dedicated a plaque to commemorate the cadets who graduated from the program and served across the world. A. Sue Weisler Air Force and Army ROTC cadets pose with RIT President Munson. He added that the RIT battalion has had success on campus, graduating strong students in varied academic programs and performing as one of the top cadres in the country. “We have had success here because of the support of the College of Engineering Technology; RIT is 100 percent behind us,” said Otero. RIT currently has 97 students in its ROTC program taking courses in RIT degree programs such as business, engineering, engineering technology, history and film and animation, for example. When they graduate from the university, they also are commissioned as second lieutenants in the Army. This year’s graduates will begin service in infantry, military intelligence, medical services corps, armor and the military police. 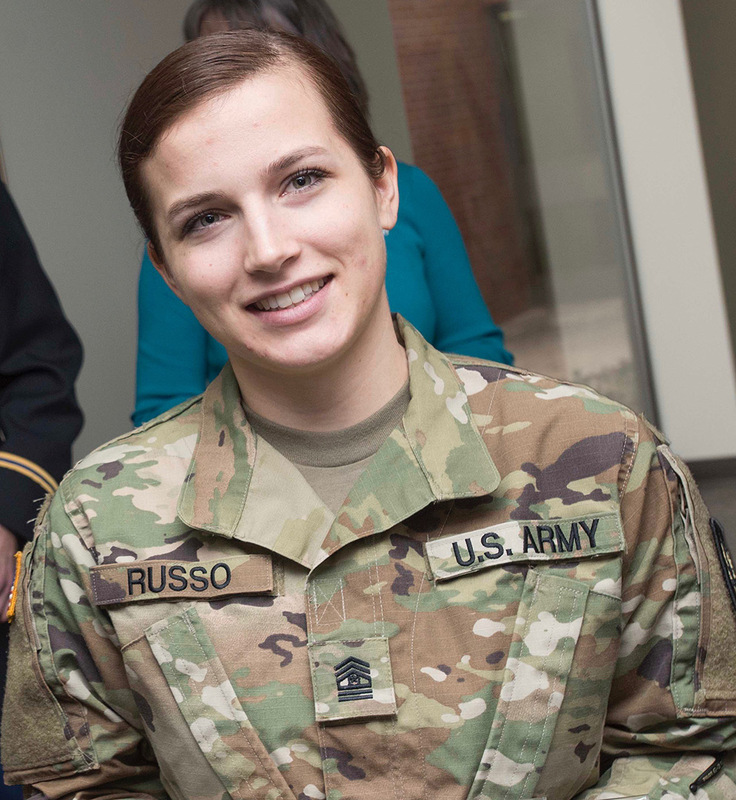 One of the graduates, Angelena Russo, will begin in the Army Reserves in Columbia, Md., training in military intelligence at Northrup Grumman. Participating in the ROTC program is a way to give back to her community and serve her country. “This is a way to help people. It is fulfilling, it is selfless and it challenges you daily. Some days you may wonder if you can do this, but seeing others doing this, you push yourself, to be better and contribute,” said Russo, who is from Syracuse, N.Y. She will graduate from RIT with a degree in computer and electrical engineering technology in May. Russo and 17 of this year’s graduating class were honored at the annual Military Ball, later that evening, walking under the traditional saber arch. The tradition symbolizes a rite of passage for the seniors and honors their work and dedication in pursuit of becoming commissioned officers. Following in the footsteps of other RIT ROTC graduates before them, the group will have relationships and responsibilities from ROTC today that will impact their service tomorrow, said Otero, who expects to retire this year. He began in the Army in 1997 as an armor officer and continued service both in the U.S. and internationally. In the Rochester area, students from regional universities can participate at RIT, in its Army or Air Force ROTC programs and the University of Rochester, in its Navy, Marine and Coast Guard ROTC programs. RIT has welcomed veterans since it began and offers the Yellow Ribbon program, providing qualified veterans and dependents full tuition coverage; the university also has an established veterans club and the Veterans Upward Bound program. Images of plastic bags and bottles clogging beaches and oceans have some calling for a ban on all such products. But packaging experts say it’s not that easy to eliminate a highly effective material. Instead, researchers at RIT are looking to strike a balance: Find a way to produce plastics that retain their best qualities and yet are more environmentally friendly. WHEC-TV mentions Wegmans’ partnership with RIT’s Center for Sustainable Packaging.